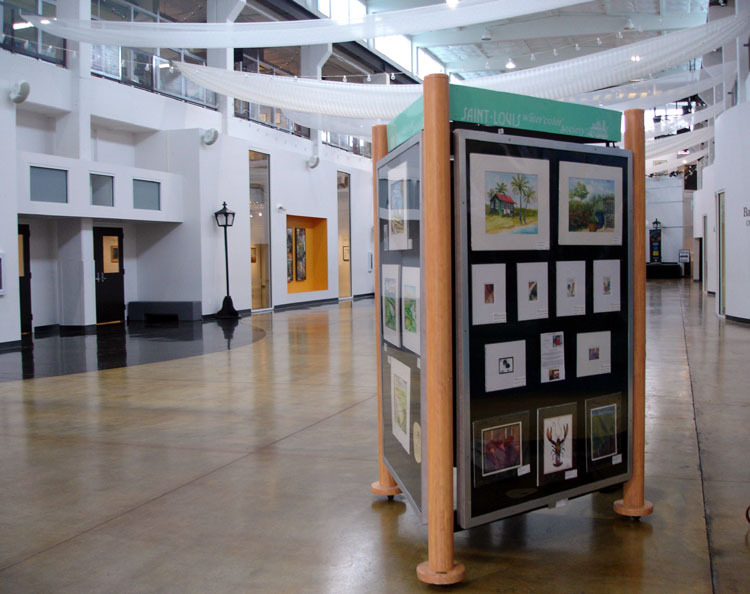 This is the Saint Louis Watercolor Society Showboat kiosk, currently housed at the Foundry Art Centre in St. Charles. The Foundry Art Centre is a dynamic, busy, venue with monthly exhibitions, classes, resident artists, and rental functions. Our kiosk is always prominently displayed in the main gallery. See their website click here. SLWS members may rent one side of the kiosk for 2 months for $20. Art displayed is to be matted, but not framed, and both originals and prints are accepted. Work is secured to the felt of the panel with velcro. Sales are handled by the Foundry personnel with a 35% commission going to the Foundry. Change-out dates are 1st of the month, Feb, April, June, August, October, December. Contact Linda Green/Metzler at lgmetzler@charter.net or 314-469-3205 to reserve your space! The current exhibit features Rosie Phillips, Judy Grewe, and Linda Green/Metzler. There are openings available, 2 in April, 2 in June, 3 in August, 2 in October, and 3 in December, so call now!